Who will win the fight between Panther and Jaguar? Nothing can be more beautiful, powerful, fierce and dangerous than these wonderful creations of the god. Nature gives us so many aww striking creatures that just steal everyone’s eyes. But wait these two creatures are good enough only when they are far from you or you are seeing them in the zoo. Because as far as the records in history they are not very friendly and seems that they don’t like humans much. Yes, these two more than dangerous than you can ever imagine Panther and the Jaguar both the names are the way to familiar. And yes both of them belongs to same family “the big cat family”. They might be cousins for sure with the equal amount of power in their blood. Tigers Lions, Jaguars, Leopards, Cheetah and Panther are really the hell of creations. They are simply and amazingly wild. Panther or jaguar both seem to be Royal born. Their style, Walk, Strength, Fierce everything is just awesome. They belong to Class Felidae and Genus Panthera. 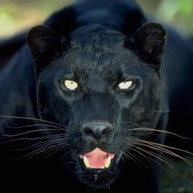 It is also known as Black Panther and is native to Asia, Africa and the Americas. It is very powerful and one of the strongest climbers of all known felines belong to the big cat family. It has a shiny coat of black fur as its skin. The melanism is helping it for better camouflaged that is good for survival and reproduction. They are mostly found in places with dense vegetation say Mount Kenya on the slopes of Africa and the tropical forests of Asian countries are another place where they can be seen. Its shoulder height reaches up to 75 cm and heads up to 250 cm. It preys on small species of herbivores. The black colour helps them to hide easily in the darkness of night and thus make it an amazing hunter. Unlike leopards and jaguars Panthers don’t have any spot on their body or tail, instead, they have smooth shiny skin. They are extremely fit and are the fierce runner, they are one of the fastest species on earth. They have sharp nails and powerful paws that they use for hunting. They have emerald green eyes that often shines in the dark. Unfortunately, they are declared as endangered or vulnerable species by IUCN. Not only running and hunting but the panther’s swimming skills are also remarkable. From ancient times they are considered as the symbol of strength and fitness. The scientific name for jaguar is Panthera onca. Jaguar is the largest cat in the Americas and is the third largest in the world. They belong to class Mammalia and Family Panthera. They are mostly found from Mexico to Northern Argentina. Their skin colour is either tan or orange and is covered with spots all over the body. 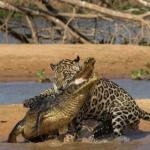 Pantanal in Brazil is the best place to spot the Jaguars. Jaguar is also considered as the fitness icon. It is one of the strongest species in the world and is able to crack a skull or shell of a turtle. Jaguars have also been declared as endangered or critical species of the earth. They have strong paws and nails that can easily tear up anything. They are the fastest runner alive on the earth and is well known for its speed. Jaguars do not socialize easily and mark their territories often by clawing on trees. In the lap of nature, a Jaguar can live for approximately 12 to 15 years of age. A healthy adult jaguar weighs around 45 to 113 kilograms. They are carnivores and meat and fish is its favourite meal. A Jaguar’s height is around 250 cm. 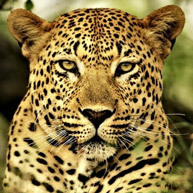 ‘Jaguar’ the name has been derived from the American Native word ‘Yaguar’ that means “the one who kills with one Leap”. Since ages, Jaguar has been bestowed as an important character in mythology and has been worshipped for its strength. Have ever seen their combat, or if you are wildlife love than for sure you must have imagined their fight at least for once. The battle will be of equal competition and one can say its only up to destiny or god that who will win. Both of them belongs to the same family so obviously will have the same power in their blood. All though both have some unique characteristics that make them distinguishable from others. 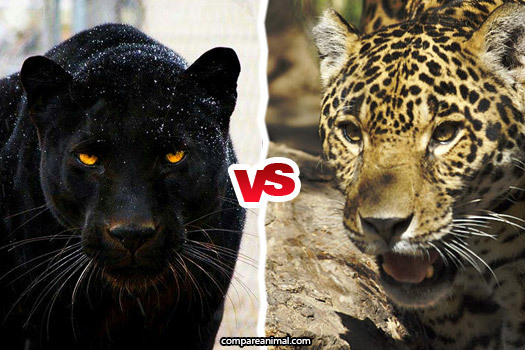 Both have astounding and enormous features on one side jaguar is the fastest runner on the other side panther is blessed with the black colour that helps it to hide and attack. Imagine what an epic scene it would be that the jaguar is running with all its speed and breath and somewhere from the top of tree jumps the panther directly onto it, then claws with claws, one over other in the middle of the bushes these two might be having a playful time with each other. Wildlife enthusiast will definitely thank the one who can capture the thrilling view. I am going with the jaguar. If I am not mistaken, panthers are basically melanistic leopards. Jaguars are usually larger and more powerful than leopards. 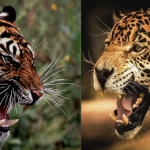 Unless the panther does not get the jaguar by the neck first, the jaguar would win – most likely with it’s nasty skull bite. 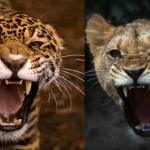 Do post more animal comparisons – such as jaguar vs anaconda, tiger vs crocodile, gorilla vs leopard, wolf vs hyena, etc. Thank you for the suggestion! I really appreciate it. 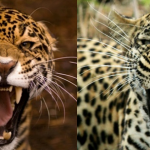 Yes Panthers are both Leopards and Jaguars, since they are both very closely related both having rosettes and often being confused which is which by other people they both have the gene so that they can both be black. Though it is more commonly with Leopards than Jaguars so if the Panther is a Leopard then i’m going with Jaguar, if the Panther is a Jaguar it’s an even match!!!! Yup, I agree with you. Sometimes panthers are melanistic jaguars. Panther can refer to a leopard, jaguar, or mountain lion. The reason they don’t give out the black panther’s scientific name is because it doesn’t have one. It’s just a leopard or jaguar with excessive melanin. Umm… panthers are just black jaguars and leopards. Its basically saying jaguar vs jaguar. Or jag vs leopard, which jag would win. The black panthers ties into genetics.